How Can Dental Bridges Help You? Dental bridges are effective options to replace missing teeth or spaces between teeth. Using the surround teeth for support, dentist bridges can create a beautiful smile. They effectively fill the gap where teeth are missing. The two common types of bridges are removable and fixed (permanently attached). Removable bridges are exactly that, they can be taken out and easily cleaned. Fixed brides on the other hand are bonded into place. With fixed bridges, only your dentist can remove the bridge. 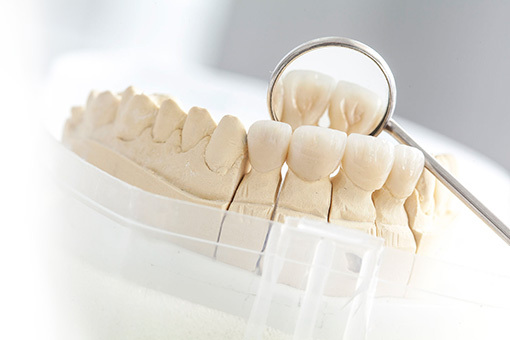 Dental bridges are very durable and will last for several years. The process of installing a bridge includes the use of a tooth crown which is place on each “natural” tooth on either side of the gap. The allows for the bonding of the false tooth or teeth. As part of typical maintenance, bridges may need to be re-cemented due to normal wear. Missing teeth should be replaced and a bridge is a great way to restore your dental health. If You Are Missing Teeth, Our Office Can Help! The installation of dental bridges typically takes a couple of visits to our Commerce dentist office. Dr. Sedki will first prepare the anchoring teeth by removing a portion of enamel to allow for the crown to be installed properly. Then, a precise mold is made which is sent to a dental laboratory, which will be used for the fabrication of the bridges. We work closely with our dental laboratory to ensure a highly accurate and correct bite is achieved. If you have missing or damaged teeth, your oral health should be your first priority. Clearly bridges offer the benefit of a beautiful smile and functionality, however, a healthy smile is more important. Many problems that arise from missing or damaged teeth, can be avoided. For example, gum disease is a known risk of missing teeth. Such problems cause stress on the tissues and gums. Our Commerce Area Dental Practice offers many treatment options for our patients including tooth fillings, sedation and children’s dentistry. Please contact us today for your FREE CONSULTATION! Need Directions To Our Commerce Twp Dental Office? Check Out Our Dental Blog for the Latest Advances in Dentistry!